By the age of 29, Hank Williams (Tom Hiddleston) was an American music icon. Since then, his lyrics and vocal style have become part of the essence of country music, striking a chord with audiences worldwide. However, many of Williams’ hits were inspired by difficulties in his personal life. His marriage, to wife Audrey (Elizabeth Olsen), was extremely turbulent, he endured near constant back pain and he suffered from alcoholism. Tragically, despite the tremendous success that Williams achieved, a look behind the scenes reveals a tortured and troubled man. Writer/director, Marc Abraham has been a fan of country music since he was eight years old. While at college, he wrote a paper about the influence of the genre on American culture. The paper focused on Hank Williams. When making I Saw The Light, Abraham focused on telling Williams’ story through the lens of his relationships, his physical pain and the deep-rooted flaws in his character. For the chaos and the desperation also inspired Williams and helped him create his most beloved songs. 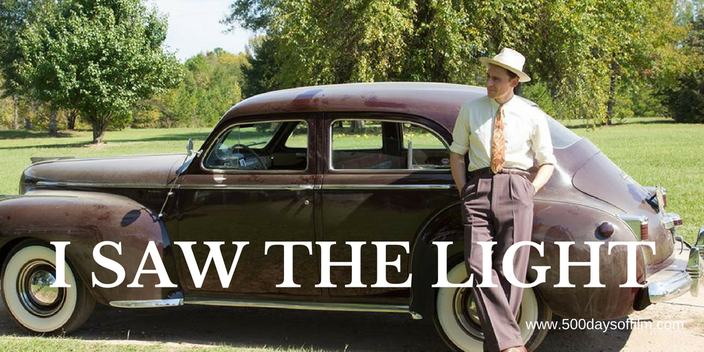 Watching I Saw The Light, it is easy to see just how much Abraham has invested into his film. Abraham explains* that he tried to tell Williams’ story “as truthfully and accurately as possible. It doesn’t manipulate events or make up scenes to illustrate his talent. It delves into the people, the actual places, and the simple everyday moments that made him who he was. I Saw The Light has a lot going for it - a passionate writer/director, a stellar cast (Tom Hiddleston is superb - he obviously worked incredibly hard preparing for this role) and a truly remarkable story to tell. Unfortunately, all of these impressive parts do not make for a satisfactory whole. Perhaps Abraham was just too close to his subject. Perhaps he knew too much and, overwhelmed, lost perspective. Whatever the case, it gives me no pleasure to report that I Saw The Light is a disjointed, muddled and frustrating film. There is just no life in this movie. Overlong, the film spectacularly fails to convey why Williams was special and how he became an icon of American pop culture. Strangely, the music itself takes a backseat - it is only at the end of the movie that we find out the impressive details of his success (Williams sold 11 million albums and had 36 Billboard hit records). While Hiddleston shines despite the film's clunky script, supporting characters feel underdeveloped and hold little interest. Elizabeth Olsen lights up the screen but is woefully under-served. While the work that went into this film is clear, I Saw The Light feels like a missed opportunity. Have you seen I Saw The Light? I you have, what did you think of this movie? Let me know in the comments section below! I haven't seen it, didn't really feel much of a call to and now even less so. Hi Jay, it is a real shame that a series of impressive parts did not work together to make an enjoyable whole film... I really got the sense that Tom Hiddleston put his heart and soul into his performance.